1: Smashing Magazine hosts their own help/tutorials as well as post external links that host many other tutorials. 2: Smashing Magazine regulartly posts links to list or actual sites of the best designed (insert anything related to design here) This can include but not limited to logos, icons, Wordpress themes, favicons not only do these resourses help with your current projects they also are great for inspiration. I could keep on describing how usefully this site has been to me and what I like and do not like about it but truth is, I will always use Smashing Magazine as a reference, or starting place for a good references with web technologies so just go check it out for your self. 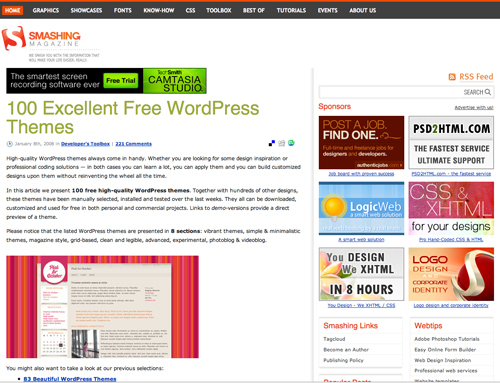 Smashing Magazine hosts their own help/tutorials as well as post external links that host many other tutorials. so just go check it out for your self.